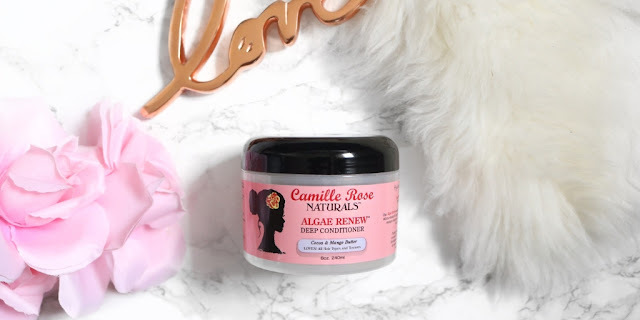 Product Review: Camille Rose Naturals Algae Renew Deep Conditioner - Hairlicious Inc. Promises: Our Algae Renew condish is handcrafted with amazing Blue Green Algae which are rich in vitamin B. Improves hair cell regrowth, stops shedding/breakage resulting in stronger, longer hair. Deeply penetrates and remoisturize dry and brittle hair. Increase body and shine THE NATURAL WAY! Directions: Apply as a mask to dry or wet hair. Leave for 10 minutes then wash with cool water while detangling with fingers or a wide tooth comb. For extra conditioning apply a plastic cap and sit under a hooded dryer, steamer or heat cap for 20 minutes. Ingredients: Deionized Water, Aloe Vera Juice, Butyrospermum Parkii (Shea) Butter, Cocos Nucifera (Coconut Oil), Behenetrimonium Methosulfate (BTMS), Cetearyl Alcohol, Theobroma Cacao, (Cocoa) Butter Mangifera Indica, (Mango) Seed Butter, Cannabis Sativa (Hemp) Seed Oil, DI Panthenol, Mel (Manuka Honey), Vegetable Glycerin, Camellia Sinensis (Green Tea) Extract, Simmondsia Chinensia (Jojoba) Seed Oil, Rosa Canina (Rose Hip) Fruit Oil, Bitis Vinifera (Grape) Seed Oil, Oenothera Biennis (Evening Primrose) Oil, Phenoxyethanol And Caprylyl Glycol, Blue Green Algae, Dimethyl Sulfone (Msm) Biotin Tocopheryl Acetate (Vitamin E), Mentha Piperita (Peppermint) Oil, Scent and LOVE! 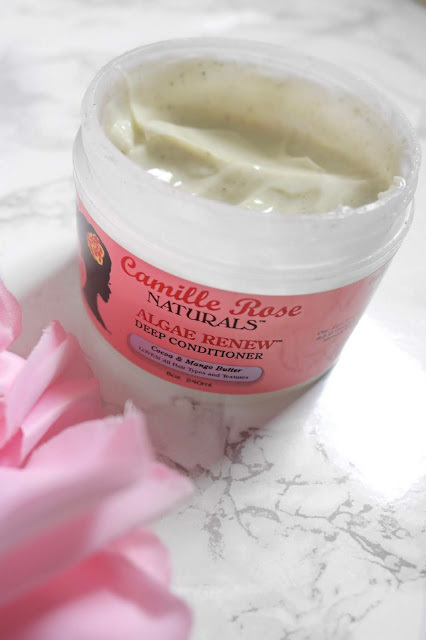 Truth: This is the first time I've ever tried the Camille Rose Naturals product line. I know a lot of naturals rave about their products, especially this particular conditioner. Anyway, fast forward to a couple weeks ago, my sister and I saw it at the Beauty Supply Store and just felt the urge to try it out for ourselves based on the great ingredients. Plus one of my IG followers listed this moisture DC as one that "her hair loves". Of course, that definitely peaked my interest. Okay, let's start with the consistency! It's rich, thick and creamy. It was easy to apply and soaked right into my hair. It smells so good - kind of like a minty cupcake because of the peppermint oil in the ingredients. I actually felt a little bit of a "cool tingly sensation" on my scalp while DC'ing with it - brownie points for scalp stimulation!! I'm glad you liked it! I'm "gachamp" that was raving about this product in your IG comments��. Honestly, there are some really good products in this line that work well for relaxed hair...I just wish they were a little less pricey.